Origen, Tertullian make Christianity intellectually respectable. Recognized those with the Spirit, gave guidelines for their ministry. Restrictions on women: None specified. Conferred spiritual authority by ordaining bishops, elders, deacons. Problem: Setting apart church leaders and distinguishing their various roles. Restrictions on women: Widows designated as church workers but not ordained. Regulated Christian life and ministry. Problem: Public image of Christianity? Restrictions on women: Severe, at home and in church. Consistent with Greco-Roman image of the good noblewoman. Defines the work of deacons, among other things. Problem: Women deacons taking on too much authority? Restrictions on women: Some women were ordained as deacons, but could not participate in eucharistic ministry, only good works. Problem: What are women allowed to do? Restrictions on women: Some are reversed. 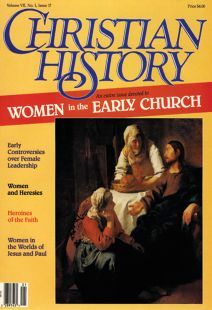 Women are encouraged to do works of teaching, visitation, etc. But they may only minister to other women.